Objective: The aim of this in vitro study was to evaluate and compare the effect of 10% sodium ascorbate, 6.5% proanthocyanidin, and 5% lycopene on the bond strength of composite resin to bleached enamel. Materials and Methods: Labial enamel surfaces of 100 extracted human maxillary central incisors were used in this study. Twenty teeth served as group I (control) and received no bleaching treatment. The remaining 80 teeth were randomly divided into four groups of 20 teeth each, based on the antioxidant used as follows: group II- bleaching with 35% carbamide peroxide gel for 30 min without the use of an antioxidant, group III- bleaching followed by use of 10% sodium ascorbate solution, group IV- bleaching followed by use of 6.5% proanthocyanidin, and group V- bleaching followed by use of 5% lycopene. These groups were further subdivided into two subgroups of 10 teeth each, based on whether composite buildup was done immediately (subgroup A) or after a delay of 2 weeks (subgroup B) post bleaching. Shear bond strength of the specimens was tested under universal testing machine. The data were tabulated and statistically analyzed. Results: Significantly higher shear bond strength values were observed in teeth treated with control group prior to bonding, followed by sodium ascorbate group. Conclusion: Within the limitations of this study, it can be concluded all the antioxidants used in this study increased the bond strength of bleached enamel. Among the antioxidant groups, sodium ascorbate showed significantly higher bond strength compared to proanthocyanidin and lycopene. Complications of bleaching may vary from postoperative sensitivity to pulpal irritation to tooth structure alterations or microleakage of existing restorations. Another important complication following bleaching procedure is decreased bond strength of composite resin to enamel. This decreased bond strength is due to the presence of oxygen ions which interfere with resin polymerization. , This decrease in bond strength of composite resin to enamel can be improved by delaying its placement after 1-3 weeks following the bleaching procedure. Several other techniques have also been proposed to remove the oxygen radical from the surface enamel. Proanthocyanidin (OPC), a grape seed extract, is a natural antioxidant that has greater potential to scavenge oxygen free radicals. ,, Its antioxidant potency has been shown to be 20 times more than that of sodium ascorbate. Another natural antioxidant, lycopene, a carotenoid found in tomato extract, is known to have free radical scavenging ability. , But the effect of lycopene on bleached enamel has not been investigated so far. Comparative evaluation of these antioxidants, namely, sodium ascorbate, proanthocyanidin, and lycopene, is yet to be done. Hence, the aim of this in vitro study was to evaluate and compare the effect of 10% sodium ascorbate, 6.5% proanthocyanidin, and 5% lycopene on the bond strength of composite resin to bleached enamel. Ten grams of sodium ascorbate in the form of powder was dissolved in 100 ml of distilled water to obtain 10% sodium ascorbate. Also, 6.5 g of grape seed extract in the form of powder was collected from capsule and dissolved in 100 ml of distilled water to obtain 6.5% proanthocyanidin solution. Five grams of tomato extract in the form of powder was dissolved in 100 ml of distilled water to make 5% lycopene solution. One hundred human, single-rooted, caries-free, maxillary central incisor teeth, extracted for periodontal reasons, were taken for the study. Exclusion criteria include fractured, cracked, and dried teeth. The roots were embedded in self-cure acrylic resin block till cemento-enamel junction, keeping only the coronal portion exposed. Labial surfaces were flattened with 600-grit silicon carbide paper. Twenty teeth served as the control group and did not receive any bleaching procedure. The remaining 80 specimens were bleached with Opalescence (35% carbamide peroxide gel, Ultradent, inc, 505 west 10200 south, south Jordan, UT84095) for 30 min, according to manufacturer's instructions. The bleaching gel was completely rinsed off with water. Then, the specimens were randomly divided into four groups of 20 teeth each, depending on the type of antioxidant used [Table 1]. Group I (control group): No bleaching. The samples were etched with 37% phosphoric acid for 15 sec, rinsed with water for 20 sec, and bonded, followed by composite build-up (3 mm diameter and 5mm height using Teflon mold). The groups II-IV were further subdivided into subgroup A (immediate) and subgroup B (delay of 2 weeks), based on the storage period prior to composite build-up as performed for group I. The results are presented in [Table 2] and [Figure 1]. Mean shear bond strength of the control group (46.94 ± 0.36) was significantly higher than all other groups (P < 0.001). Group IIA (no antioxidant used, immediate bonding) had least shear bond strength value (27.08 ± 1.15) of all the groups. Among the experimental groups, group IIIB (5% sodium ascorbate with delayed composite restoration) showed significantly higher shear bond strength. Tooth discoloration has always been a factor of utmost concern as more emphasis is being placed on esthetics. With the growing awareness of esthetic options, there is a great demand for various modalities in treating discolored teeth. Tooth bleaching has been an option since late 1870s. It permits a successful esthetic outcome at minimal expense while conserving the tooth structure. In 1994, Dishman and colleagues reported that a high concentration of oxygen remains among the enamel prisms and in the dentin following dissociation of the bleaching agent. The dentin and dentinal fluid can act as peroxide and oxygen free radical reservoir and could persist until removed by pulpal microcirculation or be released later through surface diffusion (Titley, et al). In this perspective, this property could be deleterious during bonding of the composite resin, as higher levels of peroxide or oxygen may be present in the bonding surface, inhibiting the polymerization and, thus, reducing the bond strength. Lai et al. stated that inclusion process of peroxide ions could be reversed by the use of antioxidants. ,, Sodium ascorbate is a derivate of ascorbic acid with neutral pH. It is a potent antioxidant capable of quenching reactive free radicals in biological systems. , Since vitamin C and its salts are non-toxic and widely used in food industry as antioxidants, it can be used on the dental hard tissues without creating any adverse biological effect or clinical hazards. The application of 10% sodium ascorbate was effective in reversing the compromised bonding to the oxidized enamel and dentin. ,, Hence, 10% sodium ascorbate was used in this study. Lycopene, a carotenoid compound, is a natural pigment synthesized by plants. It is a tetraterpene assembled from eight isoprene units composed entirely of carbon and hydrogen, containing 11 conjugated and 2 non-conjugated carbon - carbon double bonds (c = c). Lycopene exerts potent anti-inflammatory effects through its action as an antioxidant and free radical scavenger. The scavenging rate increased linearly with the concentration of lycopene, and reached 60-80% when the concentration was more than 0.75 mg/ml when used systemically. Lycopene is naturally accumulated in ripe tomatoes, watermelons, red chillies, and guavas, giving them their characteristic red color. Tomato and tomato-based foods account for more than 85% of lycopene. Due to its potent antioxidant potential, lycopene obtained from tomato extract was taken up for the study. Since it was used on the external surface of the hard tissues, a minimum concentration of 5% lycopene extract was chosen for this study. According to the results of this study, group I [control (no bleaching): 46.94 ± 0.36] showed the highest bond strength compared to the other groups. Bond strength was the lowest for group II (bleached and not treated with antioxidants: 27.08 ± 1.15) compared to the control and the antioxidant groups. This reduced bond strength could be attributed to the residual oxygen free radicals on the enamel surface. This liberation of oxygen could have interfered with the resin infiltration to the etched enamel and/or inhibited polymerization of the resin that cured via free radical mechanism. Moreover, in 1996, Rostein et al. reported that loss of calcium, sulfate, phosphorus, and potassium occurs owing to pH of the bleaching agents. In 1999, Hedeges et al. reported that in addition to the reduction in mineral content of the bleached enamel, such losses lead to structural alterations in the enamel, reducing the bond strength of the composite resin to the tooth. A similar result supporting this claim has been obtained in this study. In group IIB (delayed, no antioxidant: 30.64 ± 0.5), the bond strength was higher compared to group IIA (immediate, no antioxidant: 27.08 ± 1.15). This could be attributed to the partial loss of oxygen diffusion layer at the tooth and composite interface. 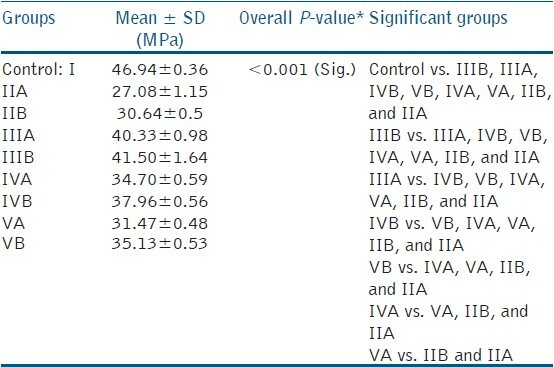 The antioxidant groups III, IV, and V showed increased bond strengths than group II (antioxidant not used), but the values were less than in group I (control group). Group III (sodium ascorbate) showed the highest bond strength among the antioxidant treated groups; both when bonding was performed immediately (40.33 ± 0.98) as well as after 2 weeks (41.50 ± 1.64). These results concur with those of Turkun et al. (2004) who reported that reduced bond strength is reversed by use of 10% sodium ascorbate solution. , The higher bond strength could be because of their potent antioxidant capacity by quenching free radicals in biological systems. Sodium ascorbate, being a reducing agent, is capable of donating two high-energy electrons to scavenge the free radicals by the mechanism called passive detoxification. The results of this study are in accordance with previous investigations done by Lai et al. 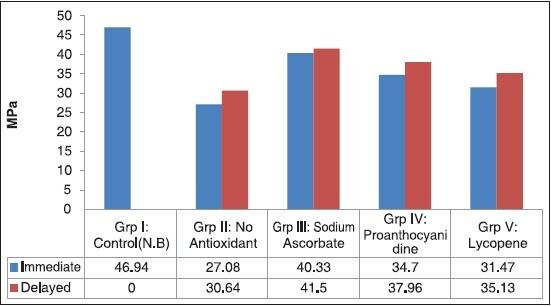 Although the surface treatment with group IV (proanthocyanidin) showed increased bond strength (37.96 ± 0.56) compared to group V (lycopene) (35.13 ± 0.53), it had lesser bond strength than group III (sodium ascorbate), which is contrary to the result of the study done by Vidhya et al. Though the bond strength values obtained for group V (lycopene) were the least among the antioxidant groups, its values were not statistically significant from group IV (proanthocyanidin). Lycopene, a carotenoid compound, is most likely involved in the scavenging of two reactive oxygen species, namely, singlet oxygen and peroxide radicals. Further, they are effective deactivators of electronically excited sensitizer molecules which are involved in the generation of radicals and singlet oxygen. Singlet oxygen quenching by carotenoid occurs via physical quenching (i.e. the carotenoid remains intact and can undergo further cycles of singlet oxygen quenching). This supports the results obtained in this study. However, bond strength with immediate and delayed surface treatments in all the groups was not statistically significant. Within the limitations of the study, sodium ascorbate has proven to be superior compared to proanthocyanidin and lycopene when used as an antioxidant in reversing the bond strength of composite resin to bleached enamel. 1. Vidhya S, Srinivasulu S, Sujatha M, Mahalaxmi S. Effect of grape seed extract on the bond strength of bleached enamel. Oper Dent 2011;36:433-8. 2. Carlos RG, Kand FA, Alessandra BB. The effects of antioxidant agents as neutralizers of bleaching agents on enamel bond strength. Braz J Oral Sci 2006;5:971-6. 3. Kimyai S, Oskoee SS, Rafighi A, Valizadeh H, Ajami AA, Helali ZN. Comparison of the effect of hydrogel and solution forms of sodium ascorbate on orthodontic bracket enamel shear bond strength immediately after bleaching: An in vitro study. Indian J Dent Res 2010;21:54-8. 4. Bulut H, Kaya AD, Turkun M. Tensile bond strength of brackets after antioxidant treatment on bleached teeth. Eur J Orthod 2005;27:466-71. 5. Türkün M, Celik EU, Kaya AD, Arici M. Can the hydrogel form of sodium ascorbate be used to reverse compromised bond strength after bleaching? J Adhes Dent 2009;11:35-40. 6. Gökçe B, Cömlekoðlu ME, Ozpinar B, Türkün M, Kaya AD. Effect of antioxidant treatment on bond strength of a luting resin to bleached enamel. J Deny 2008;36:780-5. 7. Titley KC, Torneck CD, Smith DC, Chernecky R, Adibfar A. Scanning electron microscopy observations on the penetration and structure of resin tags in bleached and unbleached bovine enamel. J Endod 1991;17:72-5. 8. Bittencourt ME, Trentin MS, Linden MS, de Oliveira Lima Arsati YB, França FM, Flório FM, et al. Influence of in situ post bleaching times on shear bond strength of resin based composite restoration. J Am Dent Assoc 2010;41:300-6. 9. Barghi N, Godwin JM. Reducing the adverse effect of bleaching on composite enamel bond. J Esthet Dent 1994;6:157-61. 10. Fine AM. Oligomeric Proanthocyanidin Complexes: History, Structure, and Phytopharmaceutical applications. Altern Med Rev 2010;5:144-51. 11. Kim SY, Jeong SM, Park WP, Nam KC, Ahn DU, Lee SC. Effect of heating conditions of grape seeds on the antioxidant activity of grape seed extracts. Food Chem 2006;97:472-9. 12. Pennathur S, Maitra D, Byun J, Sliskovic I, Abdulhamid I, Saed GM, et al. Potent antioxidative activity of lycopene: A potential role in scavenging Hypochlorous acid. Free Radic Bio Med 2010;49:205-13. 13. Lu R, Dan H, Wu R, Meng W, Liu N, Jin X, et al. Lycopene: Features and potential significance in the oral cancer and precancerous lesions. J Oral Pathol Med 2011;40:361-8. 14. Sharafeddin F, Jamalipour G. Effect of 35% carbamide peroxide gel on surface roughness and hardness of composite resins. J Dent (Tehran) 2010;7:6-12. 15. Lai SC, Tay FR, Cheung GS, Mak YF, Carvalho RM, Wei SH, et al. Reversal of compromised bonding in bleached enamel. J Dent Res 2002;81:477-81. 16. Thapa A, Vivekananda PA, Thomas MS. Evaluation and comparison of bond strength to 10% carbamide peroxide bleached enamel following the application of 10% and 25% sodium ascorbate and alfa tocopherol solution: An in vitro study. J Conserv Dent 2013:16:111-5. 17. Paul P, Hannah Rosaline H, Balagopal S. The effect of hydrogel and solution of sodium ascorbate on the bond strength of bleached enamel. J Conserv Dent 2007;10:43-7. 18. Dabas D, Patil AC, Uppin VM. Evaluation of the effect of concentration and duration of application of sodium ascorbate hydrogel on bond strength of composite resin to bleached enamel. J Conserv Dent 2011;14:356-60. 19. Yu W, Zhao Y, Xue Z, Jin H, Wang D. The antioxidant properties of lycopene concentrate extracted from tomato paste. J Am Oil Chem Soc 2001;78:697-701. 20. Titley KC, Torneck CD, Ruse ND. Effect of carbamide peroxide gel on the shear bond strength of a microfill resin to bovine enamel. J Dent Res 1992;71:20-4. 21. Kaya AD, Turkun M. Reversal of dentin bonding to bleached enamel. Oper Dent 2003;28:825-9. 22. Chikhi A, Bensegueni A. In silico study of the selective inhibition of bacterial peptide deformylases by several drugs. J Proteomics Bioinform 2010;3:61-5. 23. Porter WM, Hemingway LJ. Molecular weight profile of proanthocyanidin polymer. Phytochemistry 1983;22:569-72. 24. Aguilar F, Autrup H, Barlow S, Castle L, Crebelli R, Dekant W, et al. Use of lycopene as a food colour scientific opinion of the panel on food additives, flavourings, processing aids and materials in contact with food. Eur Food Saf Authority J 2008;674:1-66. 25. Aguilar F, Dusemund B, Galtier P, Gilbert J, Gott DM, Grilli S, et al. Scientific Opinion on the use of sodium ascorbate as a food additive in vitamin D preparations intended to be used in formulae and weaning food for infants and young children. Eur Food Saf Authority J 2010;8:1-13. 26. Stahl W, Sies H. Bioactivity and protective effects of natural carotenoids. Biochim Biophys Acta 2005;1740:101-7.